So what is multi masking? My skin is dry, oh so dry, on my cheeks. SO dry. Like a prune. Under my eyes as well – DRY. You get the picture. My nose and chin though? Not so much. They didn’t get the memo, and so my skin there tends to get oily and if I do get spots, they’ll be on my chin. Mmm. Depending on your skin, you apply something targeted in a specific area. Such as, something clarifying where you get oily and something moisturising where you get dry. At the same time. Madness, I know. Your skin gets everything it wants that way. My skin is very needy. I read something once that you must always exfoliate before applying a mask, to make sure your pores are open and then the benefits are ten fold. Not sure how vital it is, but I like to use the Ren Glycolactic mask all over and let that do its thing for 15 minutes. On my second bottle now, it’s really such a good product for revealing radiance. 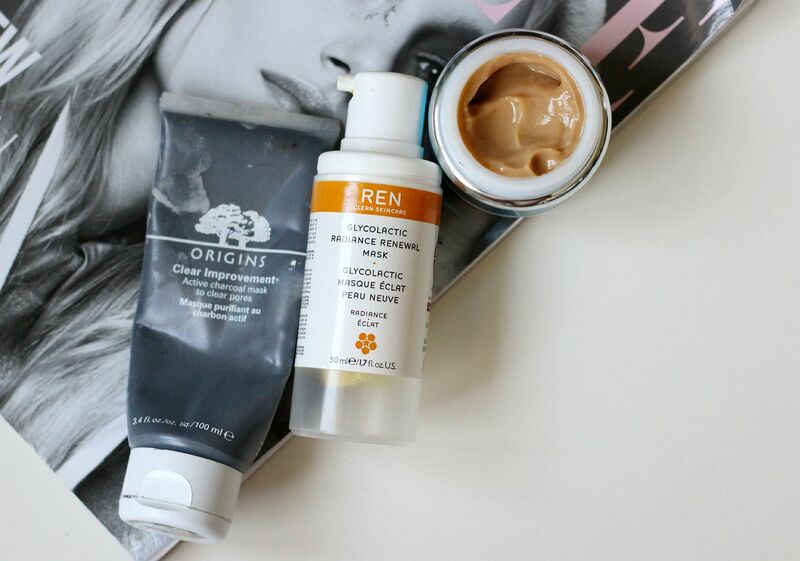 The best clay mask I’ve yet to try is the Origins clear improvement mask – it’s the colour of ink and makes your skin feel so clean afterwards. This is happily slapped all over my t zone. I think if I put it on my cheeks my face would crack into a million pieces. With moisturising masks, I have lots more options. Seen here is the Glamglow thirsty mud, which smells like coconut and leaves skin softened. It’s not the most amazing mask I’ve ever tried – I like it, but I don’t see amazing results afterwards. It does leave my skin feeling soothed though. On my eyes, I like to use the DHC revitalising moisture strips because they feel sensational and leave my under eye skin feeling refreshed. I actually normally leave those on overnight once a week. I also use the Origins drink it up overnight mask one or two times a week – can’t be beaten. If you ever want a product that will give you immediate results when you wake up, this is it. I always use it the night before a party or anything important. Do you multi-mask? Or is it all a bit too much faff for you?